This model is loosely based off of the special collections Spanish limp parchment folio, xfjn8151.1602.v2. This book has a spine title and is based on the history of Spanish kings and Roman laws pertaining to them. Towards the end of the book, there are some prints explaining how water moves around objects in a river. The structure is fairly lightweight making it easily transportable. The model is ¾” smaller in width and height to accomodate for my paper size. The original text block is composed of 35 signatures on thin paper. I adapted my model to incorporate heavy weight watercolor paper in order to be able to go in at a later point with paint and calligraphy. Since the width of the textblock was 1” and my paper is much thicker than the original, I reduced the number of signatures to 13. The textblock is sewn with all-along packed sewing on single rolled alum-tawed supports. I had difficulty finding a thin piece of alum-tawed that was sturdy enough to roll-- I instead used split alum-tawed supports that threaded through the cover as a single piece. In hindsight, I should not have split the alum-tawe and sewn a single support to be more historically accurate. I learned quite a bit in the process of researching and creating this historical book structure. 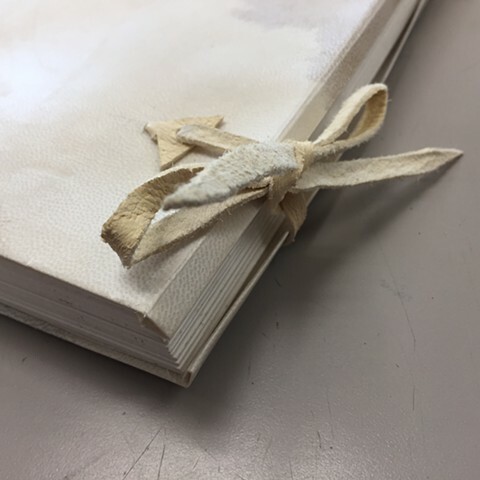 I looked at a few limp parchment folios in the special collections and appreciated their thick parchment covers, lightness, and variation in ties. I discovered that I enjoy sewing endbands and hope to try out some more complicated weavings in the future. The softness of the sanded hair-side parchment is quite nice and sturdy-- I can’t quite think of another material that can replicate this texture and I am interested in working with this material further. I tried to round the spine but I’m not satisfied with the result-- I think this method requires a bit more patience and experience. Additionally, I quickly realized that going to special collections and trying to write everything down about the book is difficult without a plan. While I did make diagrams and lists onsite, there were some fundamental aspects of the book I looked over. Chris Clarkson’s diagram of basic terminology for limp and semi-limp bindings (Clarkson 22) would be a great thing to reference when making sure I have all of my notes and measurements onsite. The original book is a folio. Since I had a specific paper in mind, I cut a 22x30 sheet of 90lb watercolor paper down to a size close to the original. This book is a bit smaller and in the future I would like to better plan out ratios. The parchment skin is hair-side up like the original book-- I wanted the parchment to be a bit softer like the skin-side so I sanded it down. My parchment has some spots and isn’t a nice consistent cream color like the original. I was tempted to use the skin-side since it’s much creamier and consistent looking but since that’s a trend from Italy in the 1550s and this is a Spanish book from 1602, I decided against that (Pickwoad, the library 226). The endsheet is not pasted down. The spanish book I referenced did not have pastedowns. For aesthetic purposes, I punched holes through the endsheet and laced the ties through it to cover the interior supports. The Spanish exemplar had paper liners that were a bit further from the sewn supports-- for structural purposes, I extended the paper liners to be closer to the supports. If I were using much thinner paper with more signatures, I don’t think this adjustment would have been necessary but because the paper is so thick, there was too much wiggle room between signatures. Clarkson suggests the bottom fold-in to be a bit thicker than the top but this varied historically. I measured most sides at 1” but kept the natural parchment profile on the top fold-in. “The most popular type of lining, the panel lining, consists simply of a piece of paper-- either clean or printed or manuscript waste-- pasted into each panel of the spine but not extending across joints. Approximately 80% of the bindings with linings, both limp and in boards, have this type of lining,” (Hilliam 30). All-along double packed sewing with waxed linen thread along split-tawed supports. The original text had a rounded spine which is why I did packed-sewing. In regards to the terminology of “packed sewing,” I found Clarkson’s introduction to the “Limp Vellum Binding” reprint explanation interesting: “I came across Peter Franck’s phrase ‘arch sewing’, a term I prefer as it reflects the result or ideal rather than ‘pack sewing’ as this reflects the manner of production and its appearance,” (Clarkson x). Headband with a bead on the spine with alternating blue and white silk threads. The original book had white silk endband threads-- for aesthetic purposes, I wanted something more colorful. The Spanish textblock endbands were abbreviated with 5 loops. Since my paper is so much thicker, I abbreviated the endband sewing with an additional 2 loops for more structural support. 5 single alum-tawed spine supports. ¼” yapp. Lacing is made with a 2-hole tacketing style where the larger piece is on the outside. I appreciate this aesthetic of the larger piece being on the outside rather than inside and from what I can tell, is appropriate to the period and location. The original book had the wider part of the tie on the inside with one hole-- the holes looked like they were punched with an awl instead of a hole puncher. I used a Japanese hole puncher to have nice crisp holes. The original book’s folded corner pieces did not have a simple straight cut miter-- the cuts looked more complex with less material at the corners. I followed Chris Clarkson’s diagram of cutting a “u” shape into the first yapp fold and then mitering the edge from there. The turn-ins are non-adhesive and held in place nice and snug with tacketed ties along the foredge. 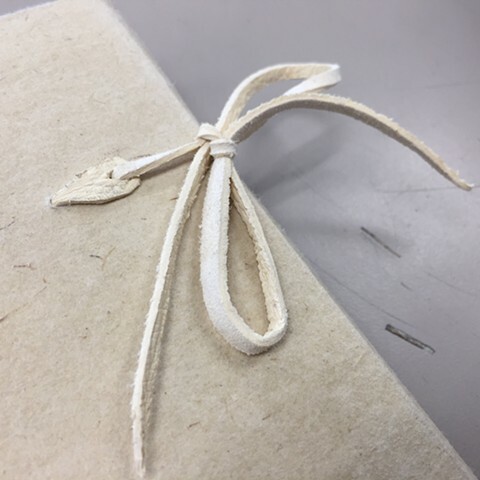 Due to material shortage, I used handmade flax paper finished with egg white sizing and burnishing to give the cover a studier texture that’s a bit suggestive of parchment. 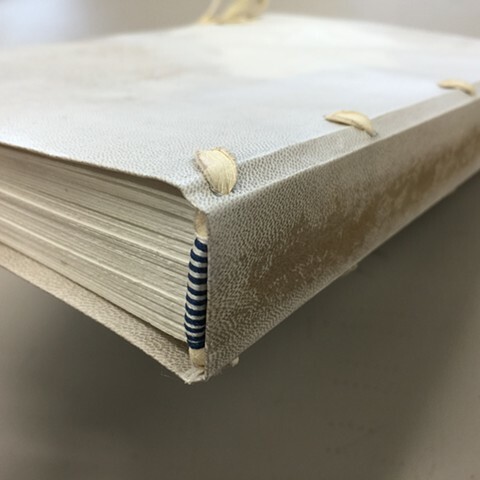 I sewed the textblock the same way as the larger limp parchment book with split alum-tawed supports, all-along packed sewing, rounded spine, silk alternating colored endbands (although these were not abbreviated and have the bead on the edge). 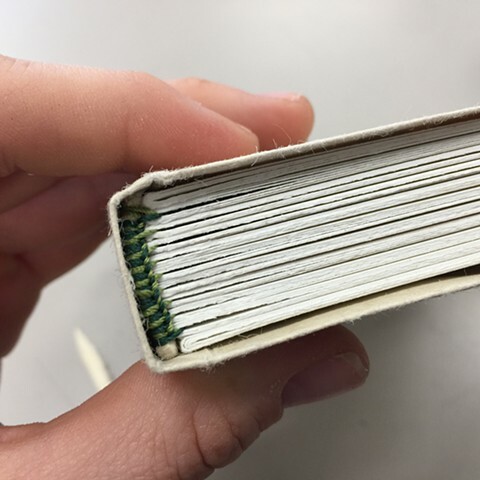 Instead of making a ¼” strip of alum-tawed with a split the width of the spine, I used &#8539;” individual alum tawed pieces and put two together when sewing. This book would more likely date to 1540s or earlier since it’s sewn on all-along double alum-tawed supports: “Abbreviated sewing begins in the 1550s” (Hilliam 32), “single supports are in use from the start (1525) on just over a third of the books so bound, and on half of them by the 1580s. In the next century they were to take over almost completely, with economy as the driving force,” (Hilliam 27). The location may have been French. Hilliam points out that: “the French normally used double thin tawed supports in the 16th century,” (Hilliam 32). -- Clarkson, Christopher. “Limp Vellum Binding.” 2nd ed.,Christopher Clarkson, Oxford, 2005. -- Hilliam, Anne. 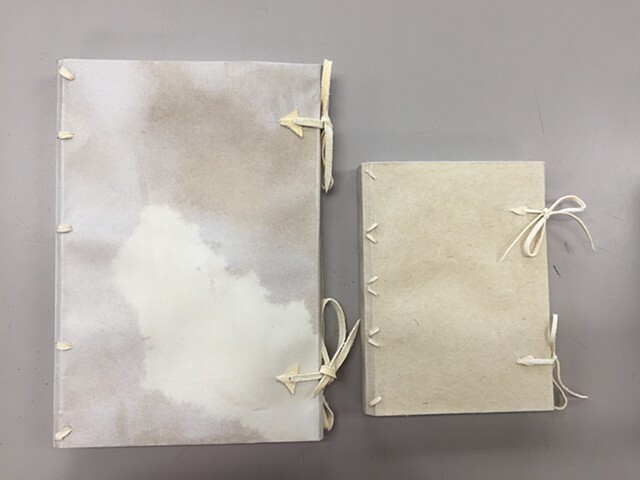 “Two Semi-limp Parchment Binding Styles.” Paper & Book Intensive, Ox Bow, May 2016. Print. -- Pickwoad, Nicholas. “The Interpretation of Bookbinding Structure: An examination of Sixteenth-Century Bindings in the Ramey Collection in the Pierpont Morgan Library.” 6th series, vol. xvii, no. 3, Oxford Journals, 1995.